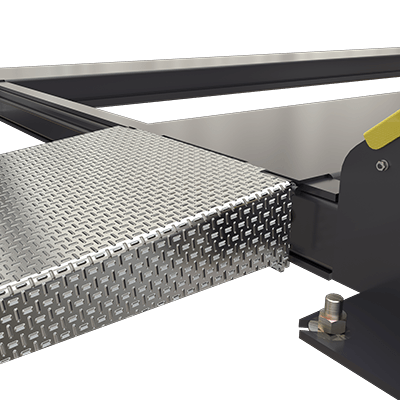 These optional aluminum approach ramps fit all BendPak HD-7 and HD-9 Series lifts and replace the standard steel approach ramps. They're particularly useful for loading low ground-clearance vehicles. The complete kit features a pair of low-profile aluminum ramps, quick-mount brackets and all the necessary hardware to make ramp removal and installation a cinch. Lightweight, low-profile ramps feature an attractive diamond plate finish that provides a non-slip surface. “I received my set of BendPak aluminum approach ramps this week, and for me they are a significant improvement over the steel ramps. I had two issues I was looking to resolve: lighter weight, as I want to keep the ramps off the four-post lift whenever possible, and longer approach for low cars. The aluminum ramps are much lighter (16 lbs. each vs. 42 lbs. each) which makes moving them around a non-issue. They attach to the lift via a supplemental bracket, which creates a vertical slot and eliminates the axle pin – much easier to remove and install. They still fit within the runways for storage. Thanks to “snowphun” on the Garage Journal forum for the kind remarks. We could not ask for a more glowing endorsement of our four-post car lift ramps. Interested in the Aluminum Ramps?